Imagine a striker tall in stature but with lightning-quick feet, a velvety deft first touch, the explosiveness of a coiled spring, the flexibility and acrobatic ability of a gymnast, and the footballing IQ in the category of the game’s cerebral geniuses. As the game continues to evolve one feature remains as relevant as ever: Total Football. A playing style exemplifying completeness, the efficiency of the methodology during the late-1970s and throughout the 1980s was nothing short of awe-inspiring. Total Football has gifted the world many things: timeless matches, a dominant model for player development, the revitalization of attacking football and, of course, total footballers. One player blessed with the mercurial ability to score and one who was baptised in the waters of totaalvoetbal was Marco van Basten. Known affectionately by fans of Ajax as one of Johan Cruyff’s protégés and by fans of i Rossoneri as ‘San Marco’, van Basten was a complete striker. The greats are remembered for their ability to produce moments of brilliance at will and at the Olympiastadion in Munich in the Euro 1988 final – one of Marco van Basten’s finest moments of brilliance came courtesy of his right boot. For years that volley against the Soviet Union has epitomised footballing excellence. That thunderous strike summed up the type of football the Oranje was capable of playing. Technique, poise, flexibility, power, ingenuity, confidence; Marco van Basten combined all of these to score one of the game’s most iconic goals. The boyish simplicity of his description is more telling than one might think. You see, when Mühren’s off-balance, left-footed service sailed to the far side of the box, van Basten was still being marked closely by a Soviet defender. Ruud Gullit was where he should have been, right in front of goal with two defenders cancelling out any potential threat he might pounce on. And the goalkeeper, Rinat Dasayev, was dutifully covering his near post. Conventional football coaching trains an attacking player to track the ball down to try to win a corner, or better yet, put the ball back ‘in the mixer’ or back in the direction it arrived. The best football training, if this sort of magic could be trained (it cannot), depends on one principle most footballers struggle with: confidence. Had Marco van Basten tried to bring the ball down, he would have been doing his job. Had he stretched his neck to flub a header to the goalkeeper, his effort would have been applauded. If he let the ball sail out of bounds for a goal kick the world would not have thought much of it. But Marco van Basten did nothing close to the conventional. Instead, he froze the moment in time, with his right boot as his paintbrush and the Munich Olympiastadion as his canvas – Marco van Basten painted his footballing masterpiece. Describing the cross, Frank Rijkaard was candid: “It really was too high.” And he was correct. A floated cross like the one Mühren’s left boot delivered would be considered routine for the defence. Ronald Koeman went on to describe van Basten’s goal: “You cannot shoot from that angle. It was very difficult – but he made his decision.” Marco van Basten made his decision and stuck with it. Great players are totally confident when other players ponder and squander the chance, doubting themselves and their ability. 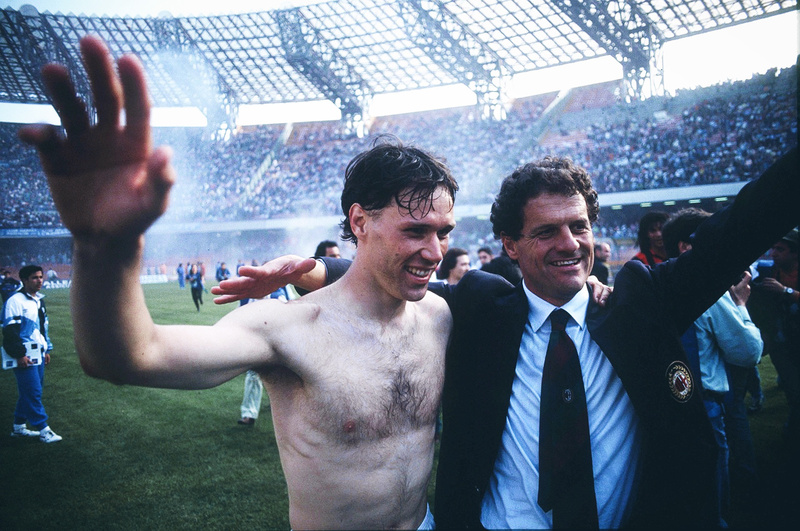 What makes this Marco van Basten’s rise to prominence worth revisiting is the mentality he continually wrestled with and eventually harnessed. Growing up in the outskirts of Utrecht, van Basten was interested in many sports, but his natural abilities suited football. “I wasn’t really focused on it. I wasn’t dreaming of it. I was just enjoying it,” van Basten recalled during an interview. On the pitch, players learn the most when they play where it is most difficult. Unsurprisingly, as a young striker who was regularly kicked up and down the pitch by frustrated and older defenders, van Basten learned to become a versatile attacker with an ability to shoot with both feet from distance, dribble at pace with close control, master a deft first touch and with play deceptively from either side. Marco van Basten also had something innate that would eventually make him a force in world football: an obsession with winning and abhorrence for losing. To satiate his appetite for the game, van Basten played football wherever he could – in the streets, on the courts by his Utrecht home, and with his youth teams, EDO Utrecht and UVV Utrecht. As is the case with some of world football’s supreme young talents, van Basten’s aptitude in the game came with a questionable attitude. 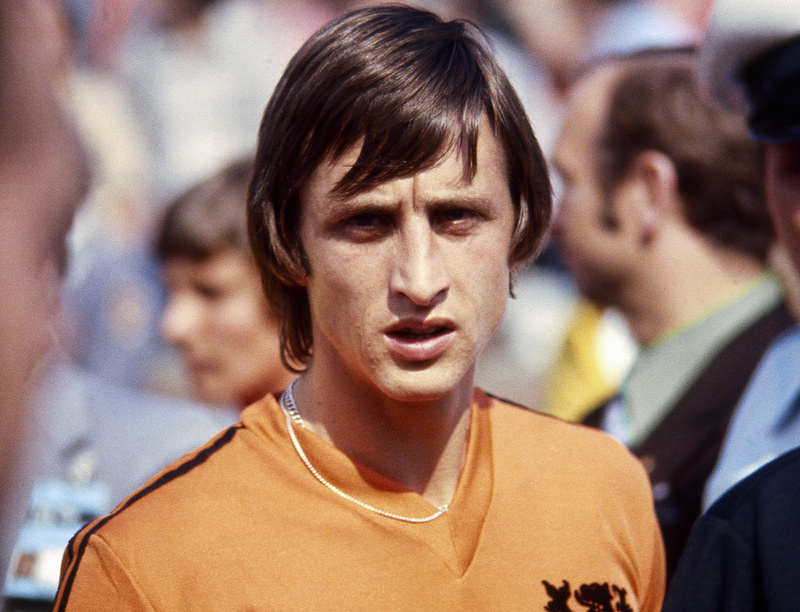 By the time he arrived at the famed footballing mill at Ajax, Dutch legend Johan Cruyff had returned to Amsterdam after a stint in the North American Soccer League. Under then-coach, Leo Beenhakker, Cruyff helped mould the technical development of the youngsters at Ajax – effectively taking an 18-year-old van Basten under his wing. In a fitting debut, Marco van Basten replaced Cruyff and scored within ten minutes of coming on the pitch against NEC Nijmegen. The reality is van Basten never stopped scoring for Ajax. After finding the net nine times in 20 appearances during the 1982-83 season he asserted himself as Ajax’s primary central striker and led the league in goals from 1983-87. Van Basten’s most prolific season in an Ajax shirt was in 1985-86, and after tallying 37 goals in 26 league matches, van Basten won the European Golden Boot award. During his final season with Ajax in 1987 the Utrecht-born superstar scored the match-winning goal in the UEFA Cup Winners’ Cup. When Silvio Berlusconi signed van Basten for AC Milan in 1987, the Dutchman had helped to redefine the role of the central striker. His style of play and proclivity to float back to collect the ball and combine with his wingers – a principle of the footballing education at De Toekomst – made him not only a threat on the ball, but lethal with his off-the-ball movement. Furthermore, San Marco had the ability to score from distance, in the box, with his head, to perform feats of acrobatic excellence bordering impossibility. The man from Utrecht was soon joined by Ruud Gullit to bolster the attack, and Frank Rijkaard to support the team’s resurgence after an eight-year scudetto drought. The next year, van Basten’s performances in Serie A and in European competition warranted him receiving the first of his three Ballon d’Or awards. By 1992, Marco van Basten had asserted himself as Serie A’s top scorer and the magic in his boots extended to European club competition as he laid waste to defences in the Champions League. Both his and AC Milan’s immaculate run of form resulted in a 58-match unbeaten run extending over two seasons. Along the way, van Basten was named FIFA World Player of the Year and the 1992 Ballon d’Or. His performances for the Netherlands are best remembered for the pivotal role he played at Euro 1988 where he scored five goals and was the tournament’s leading goal scorer. The most poignant part of the legend that is Marco van Basten is his fall from greatness. Many footballers shoot themselves into stardom only to be the agents of their own demise. In the case of van Basten, he was a victim of his own greatness. His style of play, his attacking threat, the nature of the game in the 1980s and early ’90s amalgamated in a punishing way for the Dutch striker. For every goal he scored, he was undoubtedly kicked three times. The ferocity of the tackles thrust at his ankles took a toll as did the volume of football he played. Some claim van Basten’s fate was a result of playing too much football at such a young age, while others chalk it up to misfortune. There’s a truism in sport that states: you retire when the game is done with you, you quit when you’re done with the game. And so it came to pass that by the time Marco van Basten was 28 his career as a professional player had come to an abrupt end. He went on to manage the Netherlands, Ajax, Heerenveen, and AZ Alkmaar before taking a break from the game citing mental and physical exhaustion as primary reasons to step away. We will never know what might have been if Marco van Basten’s career had not been cut short and world football knows he likely has more to offer the game in some capacity, but what is certain is such a supremely talented striker redefined the game. A man of such large physical stature personified versatility; we are all lucky to have seen such excellence on the pitch.